Formal evening dresses, black tuxedos and designer names were in abundance yesterday evening as a line of Mercedes cars queued outside the Shelbourne Hotel in Dublin city centre. A few members of the public waited patiently in the rain to catch a glimpse of the celebrity grandmas as paparazzi camera flashes lit up their faces. Mary Robinson was one of the first to arrive, followed quickly by Kathleen Watkins, and then eight-time winner Mary O’Rourke. 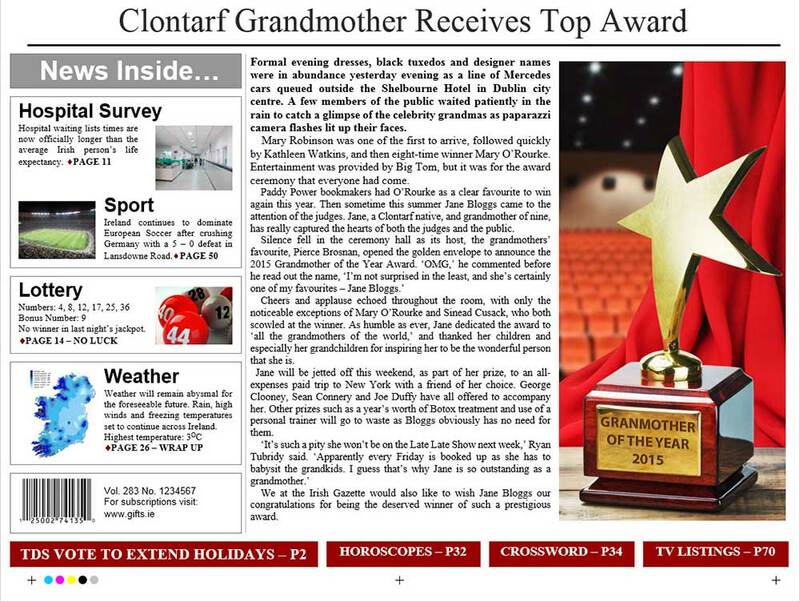 Entertainment was provided by Big Tom, but it was for the award ceremony that everyone had come. Paddy Power bookmakers had O’Rourke as a clear favourite to win again this year. Then sometime this summer [FIRSTNAME] [SURNAME] came to the attention of the judges. [FIRSTNAME], a [HOMETOWN] native, and grandmother of [NUM_GRANDCHILDREN], has really captured the hearts of both the judges and the public. 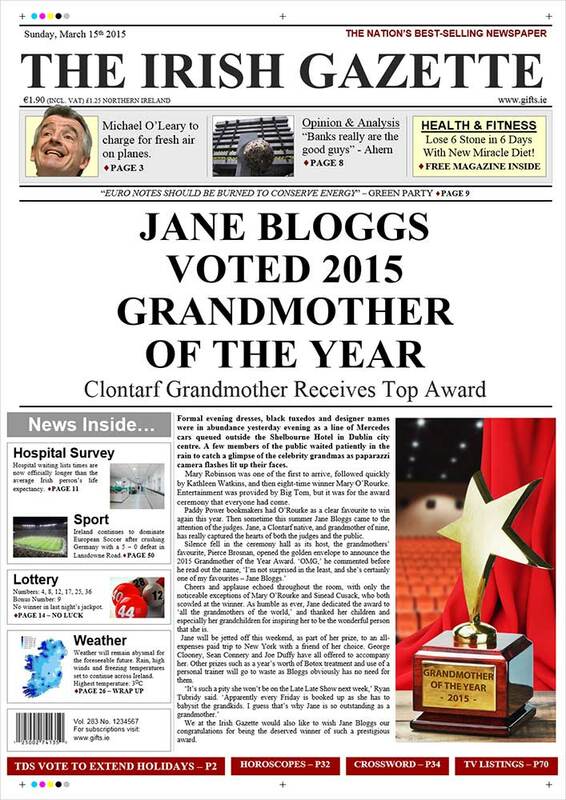 Cheers and applause echoed throughout the room, with only the noticeable exceptions of Mary O’Rourke and Sinead Cusack, who both scowled at the winner. As humble as ever, [FIRSTNAME] dedicated the award to ‘all the grandmothers of the world,’ and thanked her children and especially her grandchildren for inspiring her to be the wonderful person that she is. [FIRSTNAME] will be jetted off this weekend, as part of her prize, to an all-expenses paid trip to New York with a friend of his choice. George Clooney, Sean Connery and Joe Duffy have all offered to accompany her. Other prizes such as a year’s worth of Botox treatment and use of a personal trainer will go to waste as [SURNAME] obviously has no need for them. 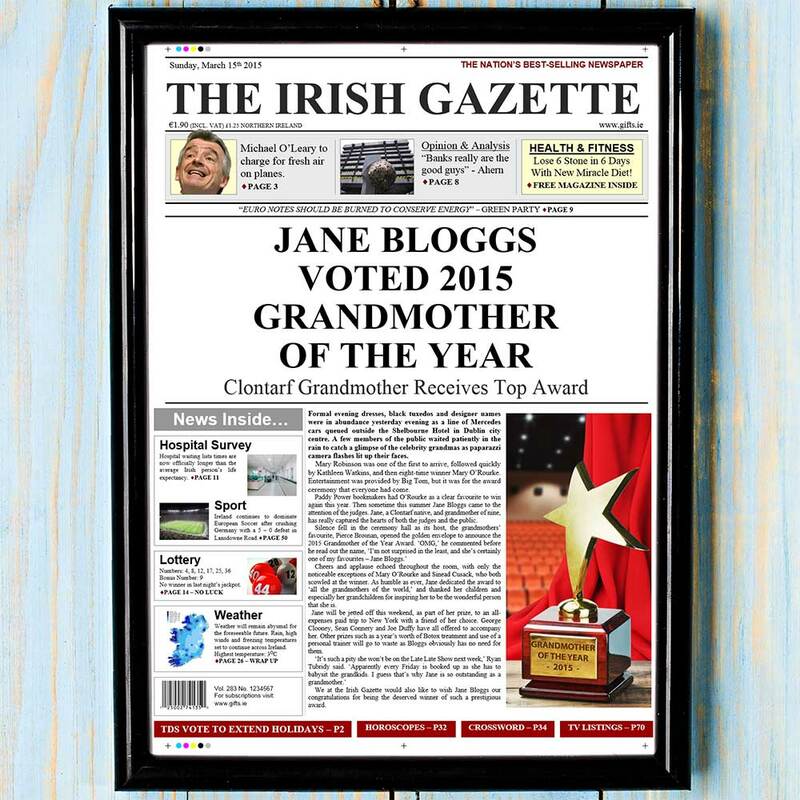 We at the Irish Gazette would also like to wish [FIRSTNAME] [SURNAME] our congratulations for being the deserved winner of such a prestigious award.